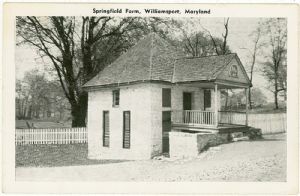 The Stone Fort at Springfield Farm was built in 1692. A spring was inside of the fort so that there would be water to drink in case of a siege by Indians. George Washington was a guest at this place. Published by E.C. Kropp, Milwaukee, Wis.
Postcards, Maryland, Williamsport; Williamsport (Md.) , History, Pictorial works.